Things have pretty quiet on the blog off late. Work has ensured that weekend eating out sojourns are largely brunch in bed/bean bag types. Kitchen experiments are more enticing than dressing up, settling on a place, battling traffic and the lunatics on the road (there seems to be a unique kind of them on weekends). This was pretty much the way things were till an interesting invitation came along - a pay-as-you-please event at Red Fork (have always been a fan of Xerxes's work) - a 3 course dinner paired with Krsma wines. The event was for a fixed number of people who made their reservations with a nominal reservation fee. Despite this event being on a school night, a darling friend agreed to babysit and so Sudhakar and I made our way through the dressing up, the traffic, the weekday lunatics and to Red Fork. Red Fork has a beautiful portico of sorts where the evening began... a session of hi-hello-how-do-you-do-nice-to-meet-you to get the group of 16 relaxed and comfortable. This was made even better by the glass of Krsma Sauvignon Blanc 2012 we picked up from the display table and the canapes that were making the rounds. We had the Feta Pesto Bites, gorgeous little floral-shaped biscuits with a piping of feta-pesto on them. Delicious no doubt, but it was the Polenta Bites with Tomato Jam and Goat's Cheese that was way up there. Several platters of these made the rounds and with good reason. The crisp little fried polenta came together brilliantly with the tangy tomato jam and the texture and flavor of the goat's cheese. The Sauvignon Blanc 2012 is an aromatic wine - a combination of citrus and floral in its notes. It packs a nice zing to it, and was a nice way to begin the evening and it went well with the canapes. There was a clear distinction between the 2012 and the 2013 that was served a little later. The group was split between the two in terms of preference. So before we made a meal out of the Polenta Bites, we were ushered inside to take our places at the beautifully set tables. The Sauvignon Blanc 2013 made its way to the table as did a very interesting warm glass tea-cup with our Amuse Bouche - a Corn Chowder with a Spicy Paprika Foam. Corn does not interest me at all but am always game to try something and dipped into this little cup. You have got to hand it to a chef when he is able to get you to eat something you normally wouldn't. The foam did add to the overall melange of flavors in the mouth, unlike many foams I have tasted that just make you feel like you have frothy toothpaste in your mouth. This foam blended into the smooth texture of the chowder giving it an interesting edge - texture and flavor-wise. The three course menu began with House Cured Salmon with Candied Orange and Zucchini. The Salmon was cured in an aniseed-orange liqueur, shaved zucchini, cucumber, candied orange, orange segments, pickled fennel and pea shoots. So what did all of these ingredients do to an already fabulous salmon - it did not overwhelm if that's what you are thinking. What it did was, enhance the taste of the fish - the textures from the fennel, pea shoots and the orange segments made for soft, crunchy, smooth and citrusy sensations. Lovely! For the vegetarians (which I opted for so that we sampled the whole menu), it was the Andean Garden - an edible garden of Eden - I mean, who would have thought Quinoa, Lima Bean, beetroot, carrots and potatoes can be converted into something you will spend 5 minutes admiring, and then very slowly breaking down and eating. Let's start with the lovely Quinoa that is placed on the bed of Lima Bean puree. Into that went the pickled beetroot and cucumber. Braised carrots stood tall. And then in the midst of all this was laid out the texture of potatoes - a heavenly potato gnocchi, braised potato and crispy potato. I was the envy at my table since I was the only one I believe with this platter. Getting the components of this dish to complement the Krsma Sauvignon Blanc was not easy and the Chef did a smart thing - the vegetables were pickled in the wine. 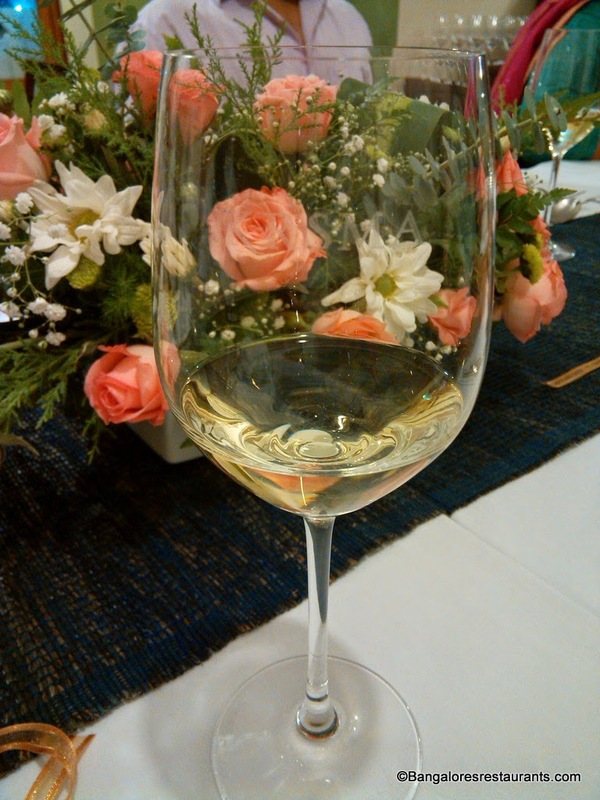 The Sauvignon Blanc 2013 that was served with the 1st course was different from the 2012, but naturally. Slightly more acidic but personally, for me, adding just the right amount of bang to what was being served. However, if I were to choose from the two I would go with the 2012 to sip on. A better look at the Andean Garden - the gnocchi you see upfront was seriously good. Moving on to the main course, the non-vegetarians were to have the Lamb 3x3 with Risoni and peas. This was paired with the Krsma Sangiovese. The vegetarians were to get the Cauliflower Risotto (which I must admit I was so, so, so skeptical about). This was paired with the Krsma Chardonnay. Let me start with the Cauliflower Risotto. I cannot tell you the number of reservations I had about this dish. I love risotto - and from the lovely ones of seafood and mushroom and more that I have tasted, somehow cauliflower just did not conjure up any good images. Till this plate below was placed before me. This was a texture of cauliflower presentation as well. The risotto cooked in a cauliflower broth and placed in a cauliflower cream, dehydrated cauliflower topped the risotto and shavings of cauliflower stock dotted the dish. The highlight was the cocoa jelly cubes on the dish that added a whole new dimension to the dish. A bitter cocoa taste to balance out the slightly sweet and smooth texture of the risotto. Though I love my lamb, I did not miss it one bit this evening. The Chardonnay 2013 was a pleasant drink with this dish. Its a fruity Chardonnay and a light one to boot. I guess that makes it the ideal candidate for just about any kind of meal. The Lamb 3x3 had three different cuts of lamb on the plate - Crispy lamb brains, lamb shoulder and lamb cutlets with risoni, pea spheres and lamb jus. Besides the lovely molecular gastronomy thing going on, on the plate with the pea spheres, the three presentations of the lamb were unique. The lamb brains were crisp on the outside and soft inside. The meats well done medium, pink to the level we like. The pea jelly and the jus did their jobs of adding on flavors and not overwhelming anything. The Sangiovese 2013 that accompanied this meal is a robust wine, and really dry. Sipping it on its own may be an acquired taste, but pair it with meats like what was served that evening and you have a real winner on your hands. The tannins in the wine stand strong and really bring out the flavor of the meat. Kudos to the wine and the kitchen team for working together on this great pairing. And finally the desserts - little bits of heaven on the platter. This Cheese and Petit Fours platter had a mini Pavlova that simply melted in your mouth to form this rainbow of flavors that will have you making goo-goo eyes at your dining partners in appreciation. Next was the Hazelnut rocca with shortbread and a sinfully delicious chocolate truffle. Three varieties of cheese - La Pondicheri with a touch of curry leaves which I really liked, the La Buchette and the Camembert by Mango Hill. Not to be missed on this platter was a small dollop of juniper berry and plum jam, enough to make you scrunch up your nose at the sour/bitter tastes, but perfectly balanced (I love bitter and sour) with the lavash. The meal ended with a choice of green tea - Green Long Din by Sublime House of Tea and Appa's Coffee by the Indian Bean. Now this is a meal that I am going to remember for a long time. Rather than tell you how much I paid for this meal (its pay-as-you-please remember! ), I want you to tell me how much you think I paid or how much you would be willing to shell out for this. A solid pat on the back to the entire team from Krsma and Red Fork for this event. Well done! !